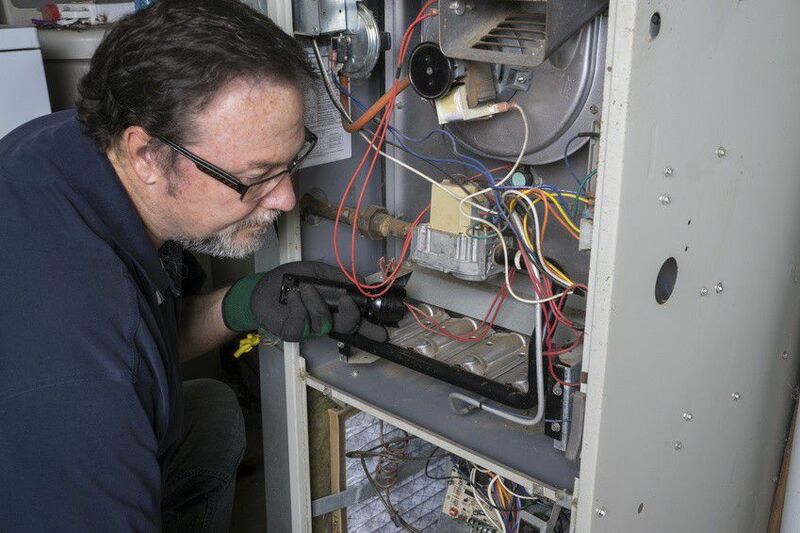 Seasonal furnace maintenance is essential to make sure your standard or high-efficiency gas furnace is running efficiently and safely. We'll walk through some of the steps in maintaining your furnace. It is also a good idea to locate a Carbon Monoxide detector badge at the furnace to monitor its safety. As with all home repairs, the first step is to turn off the power and in this case, the fuel. There should be a switch on the side of the furnace; if not, check the electrical service panel and shut off the appropriate breaker. The gas line will be connected to the furnace in a black pipe and will have a shut-off valve nearby. To shut off the gas, turn the valve so it is perpendicular to the gas line. Open the furnace door. With a vacuum cleaner having a long snorkel attachment, vacuum out the base of the furnace and the gas burners. Get all the crevices cleaned of any loose dust or debris. The furnace filter is the one component that needs to be checked and possibly changed monthly during the heating season. Replace it as part of this seasonal maintenance. Just as on your car, fan belts wear and get loose. Check the fan belt on your furnace that drives the blower. Inspect the belt for glazing, cracking or fraying. If any of those signs are evident, replace the belt. Check the belt tension. By pushing down in the center of the belt, it should feel taut and only deflect about 1/2" - 3/4". If it deflects more than that, tighten the belt by loosening the attachment bracket. Then, move the motor assembly so the belt tightens and hold the motor assembly in place while maintaining tension on the belt. If your furnace is older or if it has a motor without permanently sealed bearings, the bearings will need to be oiled. You will probably have to remove the blower motor to gain access to both ends of the motor. Find the oiling caps, one on each end of the motor. They may also be on the bearing shaft. Remove the caps and drop a few drops of lightweight household oil in the oil spout below the caps. Replace the caps and try not to over oil. Once completed, replace the furnace cover and turn the electrical power back on along with the gas. Relight the pilot if necessary. Pellet Stoves: Not So Far-Fetched Anymore?